(1) To provide a focus for people who have an interest in combat activities, but who are unlikely to have the time or resources to get into "heavy" personal combat. 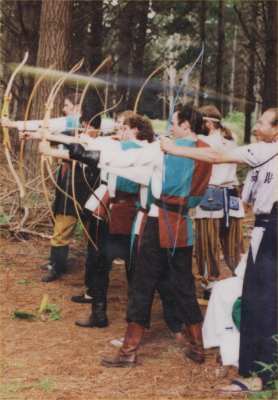 Light infantry can engage in a varied range of activities with less (sometimes no) need for armour, including boffer-knife fighting, combat archery (vs. other archers or vs. heavies) and disciplines such as the javelin or shinnai. (2) To build up the number of battle-ready personnel in the region, thus allowing for eventual trials, battles (or indeed, wars) with our neighbours and (oh joy!) among ourselves. A third ulterior motive was to try and provide a neutral ground where people from the Shire and College could mingle. At that time they were going through one of their spats, and we figured that any activity which could provide a different focal point would be a Good Thing. It took a while to develop suitable rules, agreed-upon combat forms which would let us play with visiting Lochac fighters while developing a combat form acceptable to our Kingdom of Caid, who did not have suitable rules for this format. We experimented with various blunts before we were able to get permission to use the standard Riverhaven, which were much to be preferred to the horribly heavy ones we started with. The Company had a batch of tabards in vert and murrey quarterly (the closest we could get heraldically to camo), lined on the reverse to allow us to readily split into two teams if need be. Members had an honour bar to indicate what level of skill they had and to attach the various insignia we gave for service and martial skill. I used the fact of my first pregnancy as an attempt to shame the more laid-back members of the company and fighting fraternity at large into getting their mixed combat legal armor ready for the Pen Gwynne War. The baby was due on November 11; the war was set for December 5-6. Dickon duly arrived on November 14, in time for his mother to die on the field of battle, inspiring the production of Dickon's Lament. During this time, Swift Flight had a core membership of around a dozen who would meet regularly for practice, occasional drilling and a fair degree of fund-raising and frolics. We sponsored a number of archery-related events, including Crecy and Agincourt meets to introduce people to archery and provide a challenge for the yeoman archers. Night of Champions and Fools' Feast gave us a chance to have a bit of fun and raise some funds for the arrow kitty. We held a regular Captain's Tourney to decide on the SFC Captain via the results of both archery and light combat. (I remember a young Dickon being distraught on seeing James killed by Alexander - "He's killed Daddy! Waah!" Swift Flight was active from AS26 to 31 and its former members and friends are now spread throughout the Knowne Worlde, many in positions of inexplicable respect and responsibilty. I have to confess to writing the following, which saw just the one outing. It didn't seem to go down too well with the heavies and, as we were trying to court them at the time, it seemed politic to quietly bury it. The tune should be obvious. Singing We will, we will shaft you! We will, we will shaft you! Fill him full of arrows what a wonderful sight! We are the Swift Flight Archery band. Another song which had Swift Flight associations was the Little Lights song I wrote as part of the Pen Gwynne War collection. Not quite as inflammatory. The material on this Website, except where a third party is acknowledged, is copyright to Vicki Hyde. If you'd like to use anything from it, please contact me.